New laws come into effect in just a few months, that extend consumer unfair contract protections to small businesses and that will force all businesses to consider the enforceability of their Business-to-Business (B2B) standard term contracts. These new laws could significantly impact businesses who use B2B standard form contracts. And will also impact small businesses in relation to their rights in relation to contracts that they have entered into. The changes means that how you establish and manage B2B contracts will need to change. If your business is not ready, you may find your contract does not work, and that you have opened the gates to your contracting parties arguing that clauses you want to enforce are invalid. The changes also mean that if you are a small business, you may have access to a new range of arguments to deal with difficult contracts and harsh contract terms. You need to get ready for these changes now, and ensure that you understand what these changes mean for your business. Amendments to the Competition and Consumer Act 2010 (CCA) and the Australian Securities and Investment Commission Act 2001 (ASIC Act) will come into effect from 12 November 2016, meaning that the protection currently offered to consumers will be extended to small businesses in a bid to promote a fair and transparent market. From this date, a term within a standard form contract with a small business will be void (ie enenforceable) if it is deemed to be “unfair”. This may pose a critical problem for businesses when they seek to enforce their contracts. What contracts will gain protection under the new regime? Headcount. At least one of the businesses employs less than 20 people on a ‘head count’ basis including casual employees engaged on a regular and systematic basis. Contract price. The upfront price payable on the contract is less than $300,000, or $1million if the contract is for more than 12 months. Standard Form Contract. A standard form contract is used, ie an agreement prepared by one party and offered to the other party on a ‘take it or leave it’ basis with little or no scope to negotiate or tailor the terms. Unlike the current regime[i], the amendments will apply irrespective of the types of goods and/or services being provided under the contract. What constitutes an ‘unfair’ term? Impose excessive fees on one party. 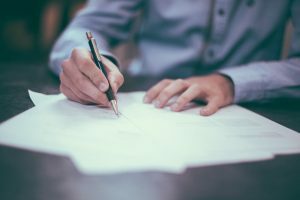 Whilst standard form contracts are still widely used and recognised as an efficient option for business agreements, care should be taken where terms are offered without scope for negotiation on a “take it or leave it” basis. Businesses should review their standard form B2B contract terms well in advance of 12 November 2016 to ensure that they do not contain provisions that may be deemed ‘unfair’. Caution should be exercised if you are a business that enters into standard form agreements with small businesses that may lack the knowledge or resources to fully understand the implications of an agreement. Simply put, if you have terms that you really want to be able to enforce against any counterparties that may include small businesses, you need to ensure that these clauses are carefully checked to ensure that they can’t be attacked on the basis of this new legislation. Conversely, if you are a small business and you think a contract that you enter into or renew after 12 November 2016 are onerous or contain terms that you were not aware of or did not understand at the time of agreement, you should ask the other party to alter the terms so that they are no longer unfair. Failing that, you should seek advice on whether your obligations are, in fact, enforceable under the new regime. Importantly, small business owners should be aware that they may be both the victim of unfair contract terms under one dealing, as well as the perpetrator of unfair contract terms under another agreement under the new regime. Additionally, care should be taken to ensure any party with which your business is entering into agreement is aware of and understands their obligations under the contract from the outset, and has the opportunity for negotiations prior to the date of agreement. This may have the effect of providing a defence if a complaint is later raised against a term of your contract. If you are dealing with small businesses (even if you are a small business yourself), you should consider the terms of your B2B standard term contracts to ensure they are enforceable under the new regime and to mitigate the risk of certain terms being declared void. If you have terms that you really want to be able to enforce against any counterparties that may include small businesses, you need to ensure that these clauses are carefully checked to ensure that they cannot be attacked on the basis of this new legislation.